Pesticides In Food: What’s In Your Fridge? Herbicides, pesticides and chemicals are used every day on fruits and veggies to help destroy germs and insects. But the question remains: Pesticides in food – how safe is it really even after it’s washed? Do you ever stop to think about what’s REALLY in the ‘fresh’ produce you eat? What you’re exposing your family to? According to the U.S. Dept. of Agriculture Economic Research Service, organic products are now available in nearly 20,000 natural food stores and nearly 3 out of 4 conventional grocery stores. Fresh fruits and vegetables have been the top selling category of organically grown food. Produce accounted for 43% of U.S. organic food sales in 2012, followed by dairy (15%), packaged/prepared foods (11%), beverages (11%), bread/grains (9%), snack foods (5%), meat/fish/poultry (3%), and condiments (3%). A recent poll showed that 45% of Americans seek out organic food. That leaves more than 50% that doesn’t. One common deterrent is the added cost of organic foods, which is reportedly about 49% more than standard produce. The other is that much of the population just doesn’t see the difference in organic vs. non-organic. The benefit is not apparent. According to Cancer.org, this year alone it is estimated that over 1.6 new cancer cases are expected to be diagnosed and almost 600,000 Americans are expected to die from cancer. In other words, about 41% of Americans are going to get cancer and about 21% are going to die from it. Of course, there’s many types of cancers. But most all cancers are caused by free radicals. And contributing factors of free radicals are chemicals that we are exposed to albeit through skin, air, or ingestion. If you buy non-organic produce and wash off your fruits or veggies, are the produce then safe of chemicals and safe to consume? The answer is, not really. Of course, washing does help remove some pesticide residue. However, many of the crops that are sprayed with pesticides or herbicides have chemicals that wash off with rain and then go into the soil. For instance, triclosan is a pesticide that is sprayed on crops. When the crops get wet, through rain or watering, the chemical runs off into the soil. It is then taken into the plant by the roots and is inside the plant. So that even if you wash off the exterior residue, the chemical will still make its way into your body. The US FDA maintains that consuming pesticides in low amounts is harmless, but some studies show an association between pesticides and health problems such as cancer. And even more scary is that some non-organic produce from the US are at higher risk then others for hazardous chemical exposure, such as green beans, carrots, hot peppers, nectarines, peaches, strawberries, sweet bell peppers, sweet potatoes, and tangerines. These are produce that you should buy organic. Produce with the lowest level of pesticide residue include avocados, sweet onions, cabbage, cauliflower, eggplant, bananas, grapefruit, broccoli, cantaloupe, and asparagus. There’s a great tool on Consumer Reports.org which shows various fruits and veggies and their chemical risk factor. 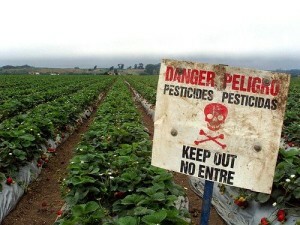 So if you want to avoid ‘pesticidic produce’ for sure, your safest bet is to buy organic. In the very least if you chose to buy standard, non-organic produce, try to stick to the low residue fruits and vegetables to minimize exposure. Even though there is a higher cost, can you really put a price on your health and the health of your family? This entry was posted in Newsletter Issues on July 16, 2015 by Health Pro.